BTES Members, please share your recent published manuscripts here. Please also send us an associated image by emailing contact.BTES@gmail.com. 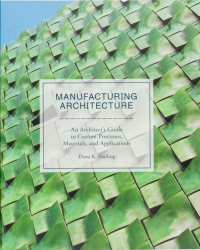 Manufacturing Architecture is the first reference guide to customizing repetitive manufacturing for architects. In this book clear diagrams and narratives explain 20 of the most common manufacturing processes for typical building components. Case studies from around the globe show how these processes can be customized in order to create variation, lower costs, decrease production waste and use a wider selection of materials. Mehta, Scarborough, Armpriest. 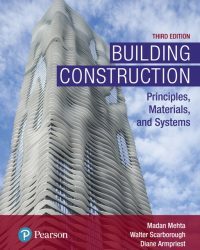 Building Construction: Principles, Materials, and Systems, 3rd Ed. Pearson, 2017. Comprehensive and fully illustrated introduction to construction methods and materials. It’s informed by a core philosophy that sufficient grounding in the principles and science of construction is the best way to equip today’s designers and constructors to respond successfully to rapid changes in the built environment. The Third Edition incorporates the latest updates available, features over one thousand new end-of-chapter problems, and now addresses common errors related to the topic. Konis, Kyle and Stephen Selkowitz. 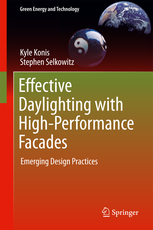 Effective Daylighting With High-Performance Facades, Emerging Design Practices. Springer, 2017. Defines requirements for daylighting that acknowledge the needs and behaviors of the building’s inhabitants for long-term effective solutions. Provides specific, climate and program-based energy and human factors to clearly identify performance objectives for designers. Discusses a range of technologies and methods in a performance-based context using simulations and real-project case studies. Grant, Elizabeth. 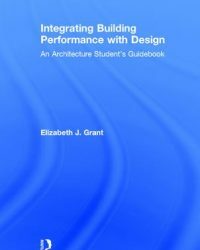 Integrating Building Performance with Design: An Architecture Student’s Guidebook. Routledge, 2017. Integrating Building Performance with Design shows you the importance of designing for building performance early in your architectural design process. The book offers you simple tools and exercises, along with examples of built professional work and successful student projects. Topics include site, solar orientation, thermal comfort, building enclosure, daylighting, passive heating and cooling, active heating and cooling, indoor air quality, stormwater, and rainwater harvesting. Dangel, Ulrich. 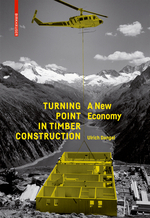 Turning Point in Timber Construction: a New Economy. Birkhäuser, 2017. Recent technological advancements allow the use of timber for the construction of multi-story structures, turning our buildings into carbon sinks rather than becoming sources for CO2-emissions.This book presents arguments for the increased use of wood as an alternative to more fossil fuel intensive building materials, with the goal of demonstrating that an integrated approach can have the potential for positive impact on the environment, local economies, and the building culture at large. deploys a detailed categorization of AESS uses according to design context, building typology and visual exposure, a method used by the American Institute of Steel Construction and Canadian Institute of Steel Construction. The book is highly illustrated with hundreds of color photos by the author, providing many inspirational examples. Alread, Jason, Leslie, Thomas, and Robert Whitehead. 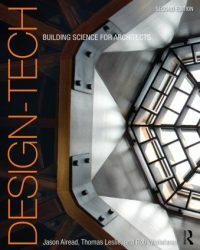 Design-Tech: Building Science for Architects, 2nd Edition. Routledge, 2014. Design-Tech is an holistic approach to architectural technology that shows you in hundreds of drawings and tables the why as well as the how of building science, providing you with a comprehensive overview. The authors also address digital fabrication, construction documentation, ultra-high-rise structures, and zoning codes. Numerous case studies demonstrate real-world design implications for each topic, so that you can integrate technical material with design sensibilities. 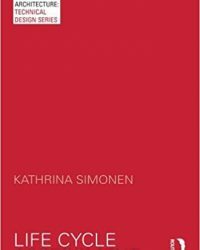 Simonen, Kathrina. Life Cycle Assessment. Routledge, 2014. Life Cycle Assessment presents the principles and art of performing life cycle impact assessments of materials and whole buildings, including the need to define meaningful goals and objectives and critically evaluate analysis assumptions. 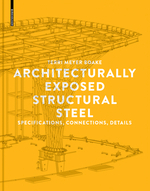 As part of the PocketArchitecture Series, the book is a practical text on the concepts and applications of life cycle techniques and environmental impact evaluation in architecture appropriate for building industry professionals. 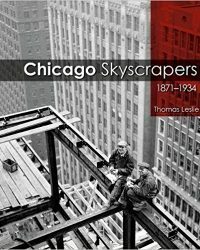 This history of the Chicago's skyscrapers begins in the period of reconstruction after the Great Fire of 1871 and concludes in 1934 with the onset of the Great Depression. During this time, landmarks as the Chicago Tribune Tower and the Chicago Stock Exchange rose to impressive new heights, thanks to innovations in building methods and materials. Edifices of iron, brick, and stone made way for towers of steel and plate glass, imparting a striking new look to Chicago's urban landscape. Trubiano, Franca. 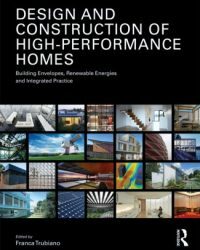 Design and Construction of High-Performance Homes: Building Envelopes, Renewable Energies and Integrated Practice. Routledge, 2013. Ambrose, James and Patrick Tripeny. 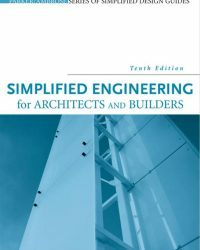 Simplified Engineering for Architects and Builders, 12 Edition, John Wiley and Sons, 2016. Simplified Engineering is a continuation of textbook series started by Harry Parker and then continued by Jim Ambrose. It is in five sections. The first section is general structures curriculum including mechanics of materials and statics. The second through fourth sections cover how to design compression, tension, bending and combined loading members in Wood, Steel and Reinforced Concrete. The final section is the application of this work on several "real" design projects. Boake, Terri Meyer. 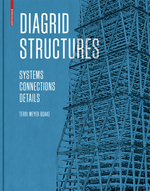 Diagrids Structures: Systems, Connections, Details. Birkhäuser, 2014. Diagrids are load-bearing structures made of steel diagonal grids. This book explains comprehensively for the first time all of the aspects involved in this new bearing structure. The author, experienced in teaching, research, and practice (recent publication: Understanding Steel Design. An Architectural Design Manual, 2011), has tracked the development of this technology from its beginnings and employs photographic documentation of the construction phases of many diagrid structures. Dangel, Ulrich. 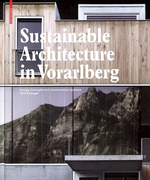 Sustainable Architecture in Vorarlberg: Energy Concepts and Construction Systems. Birkhäuser, 2010. The successful combination of a regional building style of sophisticated simplicity with sustainable construction methods has made the architecture of Vorarlberg (Austria) a model for the rest of the world. 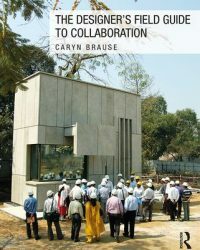 This book presents particularly successful projects from recent years involving various building types and portrays their development from design idea to built detail.